The 87th annual Academy Awards (also known as the Oscars) took place on last Sunday in Los Angeles. Some people watched the ceremony, while lots of people did not. Some saw some of the nominated movies and lots of people did not. If you were lucky enough to go to see the red carpet show, you wouldn't miss the glamorous moments of the movie stars and absolutely would record some videos of them as memorials with your BlackBerry cell phone. If your friend show her admiration and want to copy the videos from your BlackBerry to her Nokia, you may be at a loss because these two smart phones run different operating systems. How to transfer videos from BlackBerry to Nokia becomes a question we'll discuss about today. It is obvious that BlackBerry and Nokia run the BlackBerry and Windows operating systems respectively, so it's not that familiar to people who get used to handling Android phone and iPhone. To transfer videos from smart phones to computer, you can turn to many solutions such as to transfer videos from Android to computer or from iPhone to computer. But to transfer videos between smart phones, in particular between BlackBerry and Windows, it is totally another thing. In this article, we'll kindly introduce a phone transfer program to solve the problem for BlackBerry and Nokia users. It's MobiKin Phone Transfer software. As a third party program, it allows you to transfer videos from BlackBerry to Nokia freely and you can also copy videos from Nokia to BlackBerry. As for the data, you can copy other files like apps, music, contacts, messages, call logs and photos, etc. between these two devices. 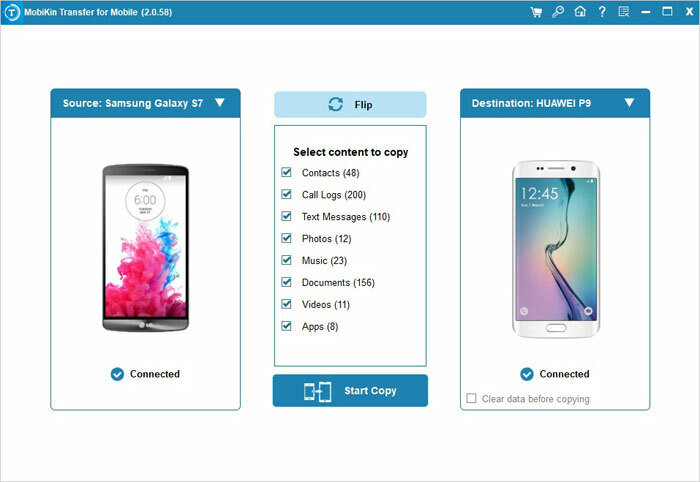 This software is of great compatibility that it can support nearly all smart phones on the market such as Samsung, HTC, Sony, Motorola, LG, Google Nexus, Huawei, iPhone, BlackBerry and Nokia and so on. You can transfer videos from either device to another. It's high time that you got a free trial version to download and install it on your computer. A tutorial will be made to instruct you to use the software step by step. Install the phone transfer program on the computer. Launch it and you'll see an interface like this. Connect the BlackBerry and Nokia phones to the computer via USB cables and select the "Phone to Phone Transfer" mode. The software will start to detect the data. And the BlackBerry and Nokia will be in the "Source" and "Destination" area. To transfer videos from BlackBerry to Nokia, you can mark "Videos" and then click the "Start Copy" option. You can also transfer other files in the middle menu between the two devices if you want. Note: If you found the devices are in the wrong positions, you can click "Flip" on the window to change their order.